This is a HAND-CRAFTED item. 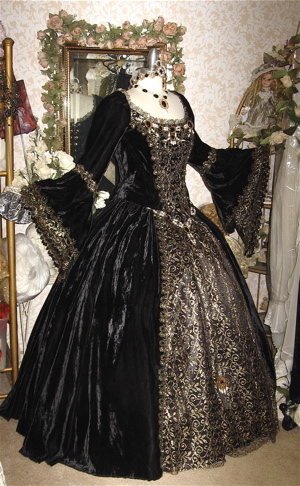 This set includes: HOOP SKIRT, BODICE, AND SKIRT. 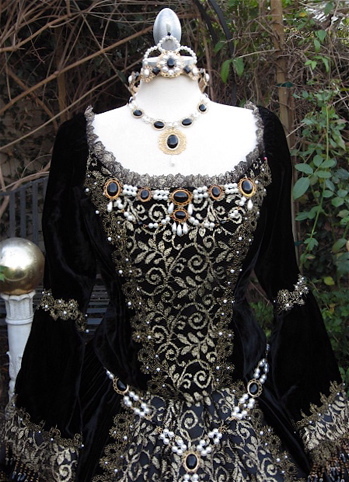 We are also including a custom tiara, necklace, belt and bodice jewelry to match gown- the jewelry included is gold and black with white pearls. 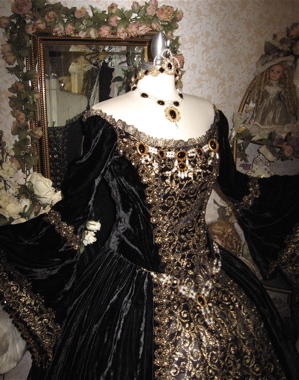 White pearls have also been sewn onto the gown to match. 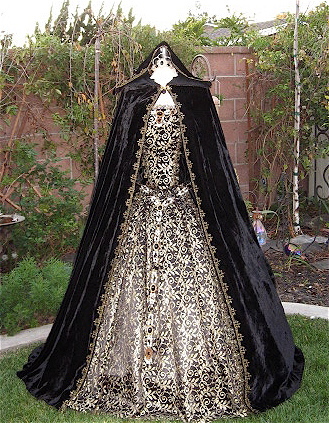 Matching cape with hood and train is also included. 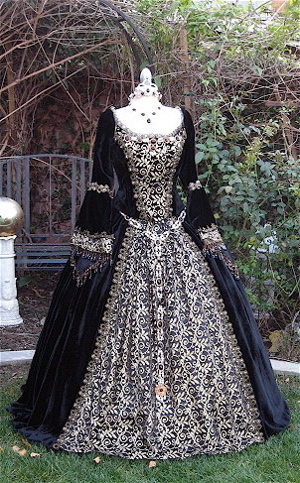 Gown is perfect for a Theme wedding....and will suit a variety of styles including Renaissance, SCA, Medieval or Victorian.....This gown is nice and dramatic! 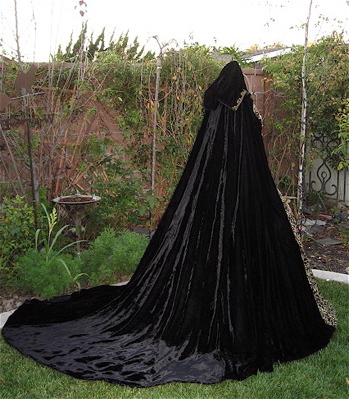 We TAKE OUR TIME with our one-of-a-kind gowns.....working on them as we have time. 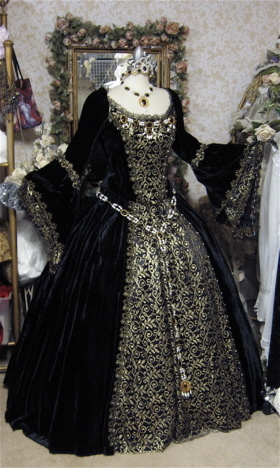 Sometimes a gown like this takes months....with pieces/fabrics collected over a long span of time....until we have enough item to make a "special" item! 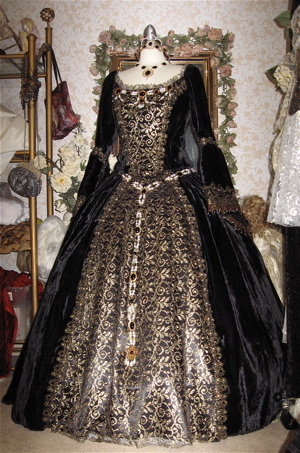 Fabrics used for this set: GORGEOUS seal-skin type of velvet. 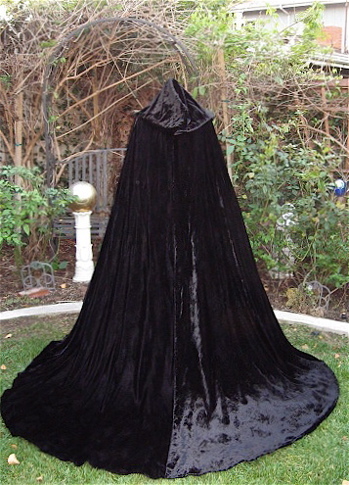 Velvet is almost like a Silk velvet, hangs beautiful and is very soft and flowy. 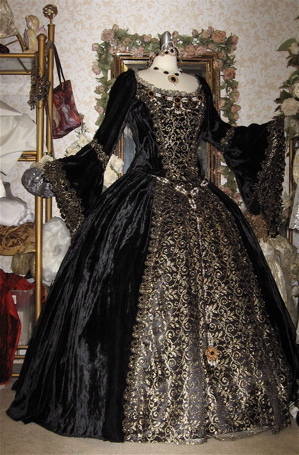 Trims used are muted gold/black venise laces, trimmed with white pearls. 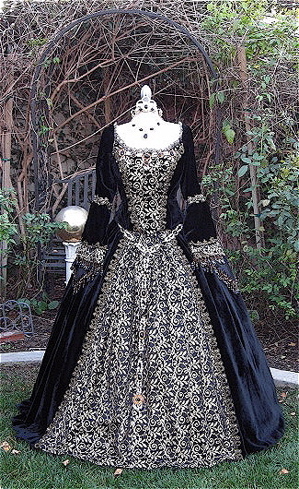 Front panels and sleeves have a soft chantilly type black/gold lace with swirls. 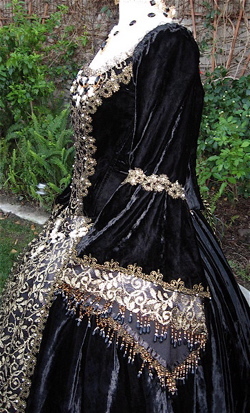 gold/black beaded fringe hangs from the 3 layer sleeves. Modesty panel in back makes this totally adjustable. 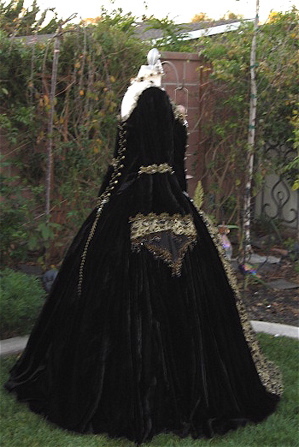 This will *include* the white hoop-skirt which has an elastic hook-back waistband.... hoops, and a tulle-overlay so hoops do not show through. 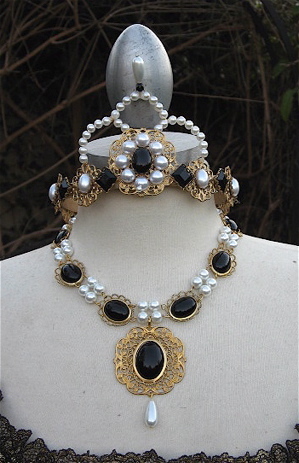 Beautiful black/gold and pearl bodice jewelry, belt, tiara and matching necklace/earings!! This is a HAND-CRAFTED item. 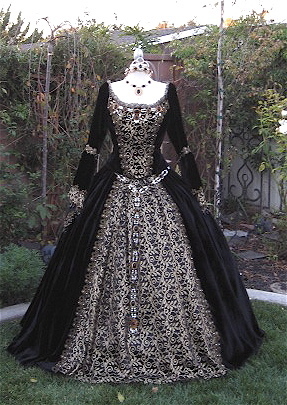 You will not find a gown with this much work/detail for this price! This is a high-quality item....not a lightweight cheapy costume. More than bridal quality.... 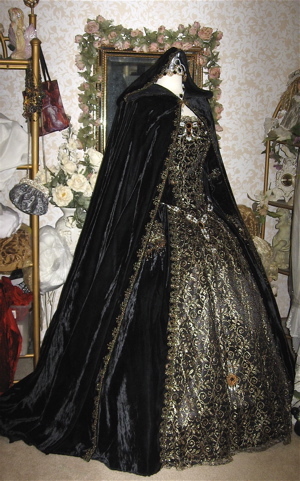 This set includes: Hoop-Skirt, Skirt, and Bodice...also included is a beautiful necklace, bodice jewelry that pins on, tiara, belt and earrings- as well as a matching cape. 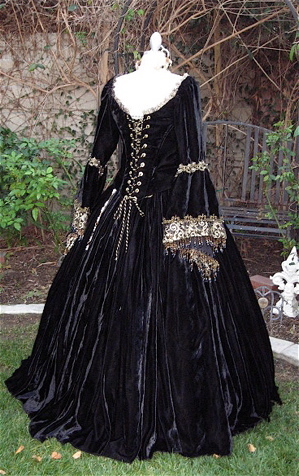 All you need are shoes......Gown is perfect for a Theme wedding....and will suit a variety of styles including Renaissance, Medieval, Gothic or Victorian.....DESCRIPTION OF THIS GOWN: Skirt has a waistband and hooks at the back waistline. 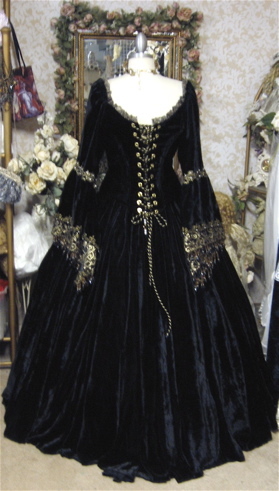 Skirt is nice and full, and will sit over a 4 hoop crinoline with tulle overlay. 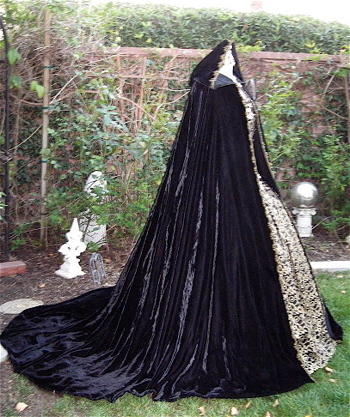 Skirt front panel is a muted gold/black swirl lace fabric lined in black crepe back satin. 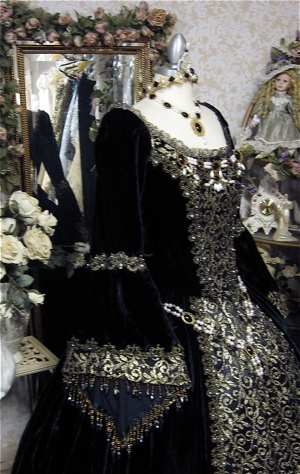 Panel is trimmed with gold/black venise lace that is hand beaded with white pearls. Skirt bottom is serged, so you can easily shorten or hem it to your length, or we can do it for you here. 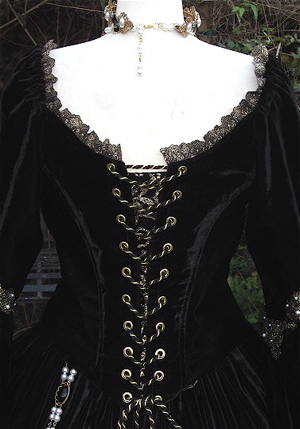 The bodice is lined in black crepe-back satin, has boning, and gold grommets to lace up the back. 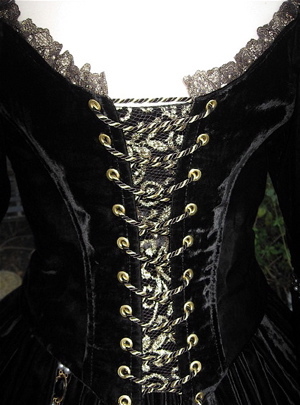 Black/Gold rope lacing is used for the back, and there is a black/gold modesty panel, which makes this bodice adjustable. 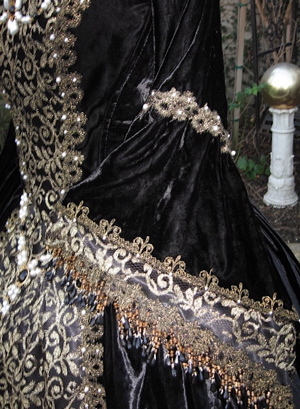 Front panel is gold/black lace fabric, trimmed with black/gold venise lace which is hand beaded with white pearls. 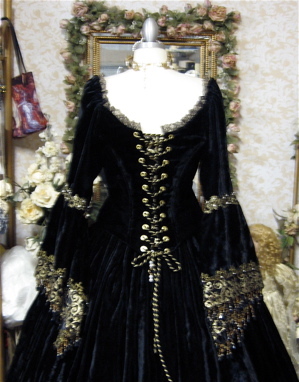 Gorgeous soft black/gold lace trims neckline, goes up and over shoulder to back. Shoulders/sleeves have elastic over the shoulder and can be worn on or off the shoulder. 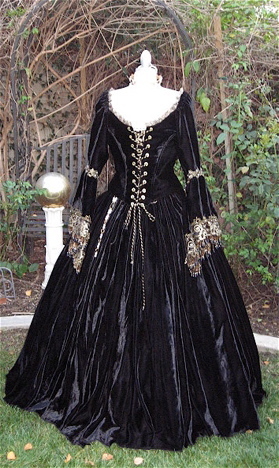 Renaissance style sleeves are 3 layer. 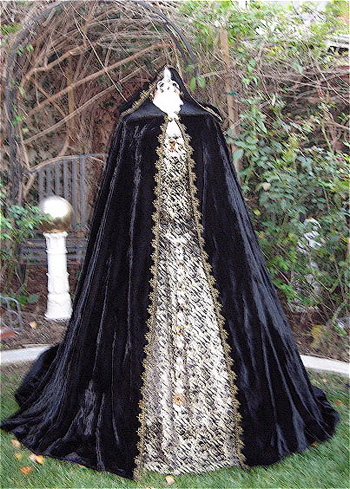 Underlayer is black crepe back satin with gold/black venise lace trim, and hanging black/gold beaded fringe. 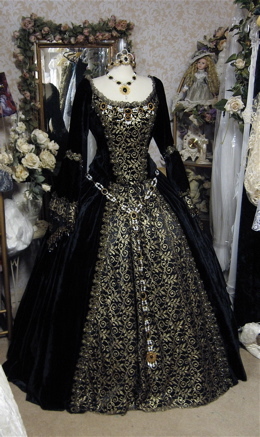 Middle layer is gold/black lace fabric. 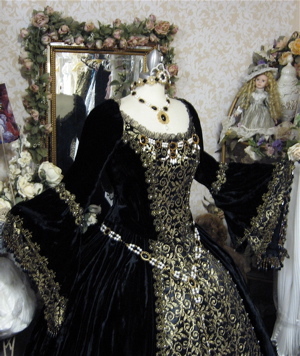 Top sleeve is black velvet trimmed with black/gold venise lace trimmed with small white pearls. Below see modesty panel....can add up to 4-5 inches to the back.